The new optional modular Rotork plug and socket interface provides a fast connect / disconnect option for IQ3 multi-turn and IQT3 part-turn actuators, encompassing 3-phase, 1-phase and DC (IQT3 only) electrical variants and including many actuators with explosionproof EXd enclosures conforming to ATEX, IECEx, CSA and CSAus international standards. The plug and socket terminal cover maintains the integrity of the actuator’s double-sealed enclosure and IP68 watertight environmental protection (submersible in 20 metres of water for 10 days). A plug and socket interface is favoured in some industries for providing quick and easy field wiring and quick removal or interchange of actuators for maintenance and other operating requirements. The Rotork solution provides further flexibility to the advanced, user-friendly design of the IQ actuators. 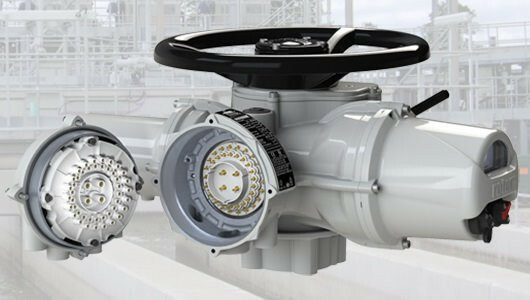 These include secure Bluetooth® non-intrusive setting and commissioning, an information-rich display, real-time status reporting and configurable datalogging to provide detailed analysis of the valve condition and asset management support. More information on the IQ range can be found here.